Tracking Discharge & ‘Cell Wear’ for NP-BX1 Lithium Ion Batteries « Adafruit Industries – Makers, hackers, artists, designers and engineers! 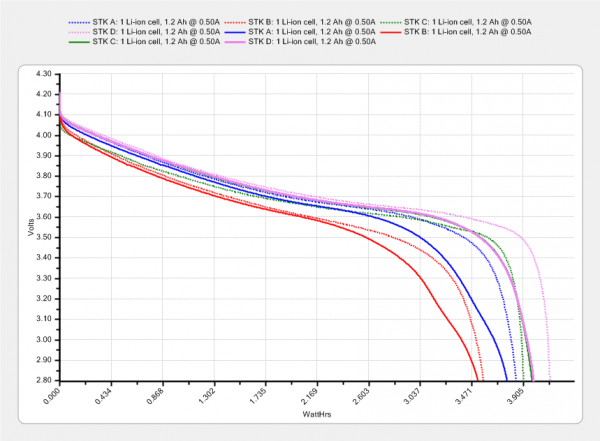 I use two of these batteries to power my RX100M4, so it’s intriguing to see someone else’s analysis of these lithium ion cells. Ed Nisley is using them to power an ‘action cam’ – I use them for standard point-and-shoot, so I’m also curious if there’s a difference in wear-and-tear between the two (video vs photo) formats. The dotted curves come from early November 2015, when the batteries were fresh & new, and the solid curves represent their current performance.